Made up of hundreds of islands stretching from the south of Kyushu to Taiwan, Okinawa has always been a bit different from mainland Japan, in fact, it wasn’t part of Japan until the 19th Century. Till this day, islanders have their own dialects, a vastly different cuisine and even their own appelation-controlled distilled spirit. Also known as Japan’s Hawai’i, Okinawa is home to gorgeous beaches and has a mild subtropical climate. Okinawa Island, the prefecture’s largest isle, is the administrative and cultural centre, and where most visitors will spend their time. Janice Leung Hayes was traveling with the Yardbird team, who are presenting a two-night Okinawa event at their restaurant on December 12 and 13. Following their trip, chef Matt Abergel and his crew will be cooking a special tasting of dishes inspired by Okinawan flavours and ingredients to be paired with Awamori high balls, cocktails and Orion beer. There’s no better place to go for greatest hits of classic Okinawan fare, like bitter melon (goya), Chinese onion (rakkyoo) and Okinawa soba (not actually buckwheat noodles, as “soba” is known on mainland Japan, but wheat noodles) than Urizun, opened in 1972. This rustic, bi-level old-school izakaya is an institution, beloved by locals and visitors alike, be it for a cheeky after-work awamori or a group celebration. While Okinawa doesn’t boast huge amounts of farm land, they still have a number of specialty regional foods, like Agu pork. These pigs are incredibly small, around half the size of a normal pig, and are said to have been introduced to Okinawa via China. Incredibly tender, with a slightly sweeter flavour than regular pork, it’s rarely fouond outside Okinawa. 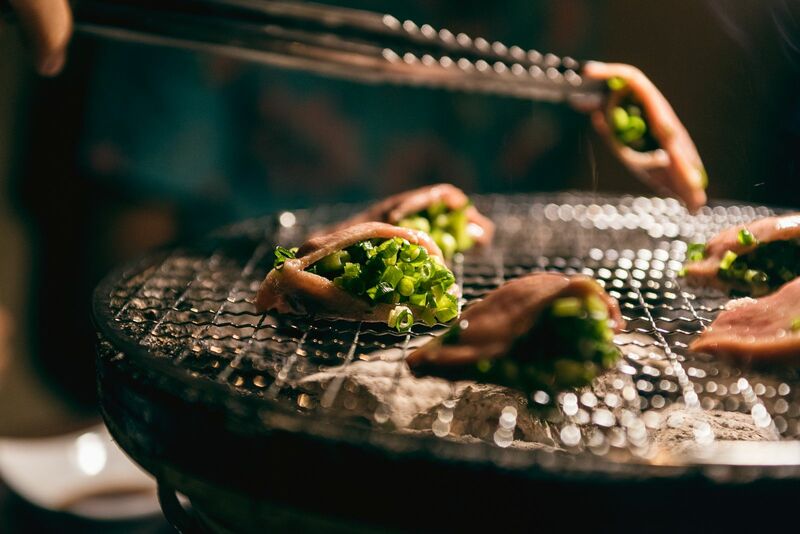 Ryuumi specialises serving every part of the pig, and you grill it as like on a do-it-yourself grill at the centre of the table. Taco Rice is pretty much what you think it sounds like – taco fillings – beef chilli, shredded cheese and lettuce – served on rice. Okinawa has a long and delicate history with the United States, and the islands have been dotted with American bases for the past 60-odd years, and taco rice was said to have been invented by King Tacos for hungry servicemen wanting a late night snack. The snack stall has now become a local chain, and this is the flagship. Hidden in the foliage, a casual driver would never think that a sharp, uphill turn off the Okinawa Expressway would lead them to this idyllic, carb-alicious sanctuary. This little cottage in the hills slowly turns out a gorgeous array of loaves and buns, from umami-rich seaweed to the deceptively simple roll featuring molasses-like Okinawan brown sugar. If time allows, stay for the sandwiches, with locally-influenced fillings like ham and ooba (a type of perilla/shiso). Pizza hounds, particularly in Asia, know that some of the best pizza in the region can be found in Japan, but few think of finding it in Okinawa. Chef and owner of Bacar, Daisuke-san, trained at Savoy, one of Tokyo’s most storied institutions for Neapolitan pies, and he continues the tradition of only making Marinara and Margherita. Each pizza is made to order, and the woodfired oven must be carefully preheated each time, so make patience, and the lardo-topped sweet potato appetiser, your best friends. The tipple of choice in Okinawa is awamori – a local, appelation-defined spirit made with Thai rice (which again, speaks to the archipelago’s unique history) – and at local izakaya like Urizun (see above), you’ll see most locals drinking it with a bit of water or ice. However, a new wave of bartenders like Shiokawa-san are beginning to use it in cocktails, from classic mojito-like applications, to more creative flourishes that have won them awards throughout the region. The drive into Gala and Sea Seed alone are almost worth the trip to this seaside salt factory and coral restoration centre. Take the whole family to this double bill – at Gala, curious kids can witness sea salt being made, and you can even try your hand at making it yourself in the workshop. Down the hill at Sea Seed is a marine conservation centre whose main goal is to help restore the coral in the immediate area, where global warming has left large expanses of coral bleached and destroyed. For a small fee, you’ll see the restoration facilties – pools of coral as well as rare, exotic tropical marine life, sure to impress even the most well-travelled city kids. Don’t forget to head back up to Gala for a sea salt soft-serve ice-cream to round off a day of exploring. All it takes is a quick detour off the touristy main drag of Kokusai-dori to find Makishi Market, the city’s “belly”, a warren of bustling passageways lined with everything an Okinawan home cook needs to make dinner, from pickles to seafood to katsuoboshi that’s shaved to order. For the visitor without a kitchen, fret not, as you can buy fresh seafood from the market stalls and have it taken upstairs to restaurants that will cook it for you.